Taipei, the Capital of Taiwan, is a vibrant metropolis with enough attractions to fill months, if not years. 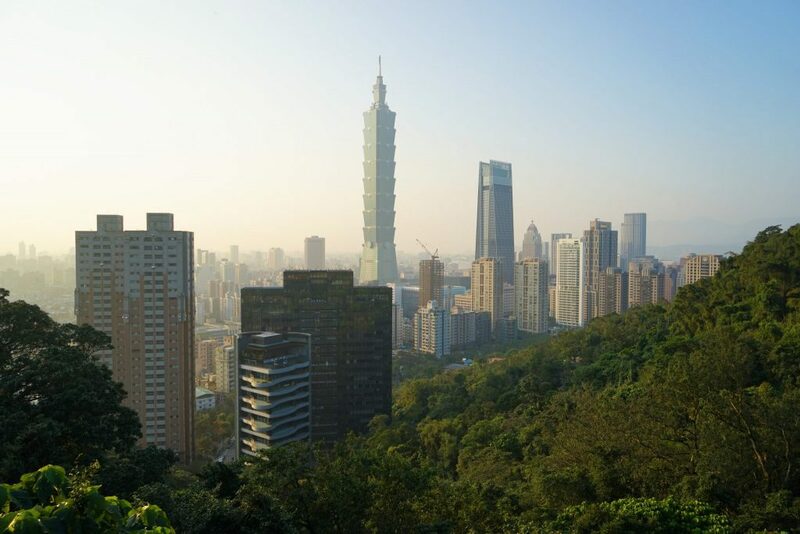 While the towering Taipei 101 skyscraper might be the star attraction, most travelers will tell you that Taipei is so much more about the feel of the city. With its unique blend of Chinese culture threaded with Japanese and American influence, you’re guaranteed to be surprised and delighted at every turn – but still, it helps to have a guide: so why not start with these quintessential things to do in Taipei! But first – a proviso – Taipei is truly a huge city and there is no way you are going to see everything here…no matter how much time you have! Approach Taipei with the idea that you are going to want to return time and time again (because you will!) and then you won’t get stressed about trying to fit in everything. 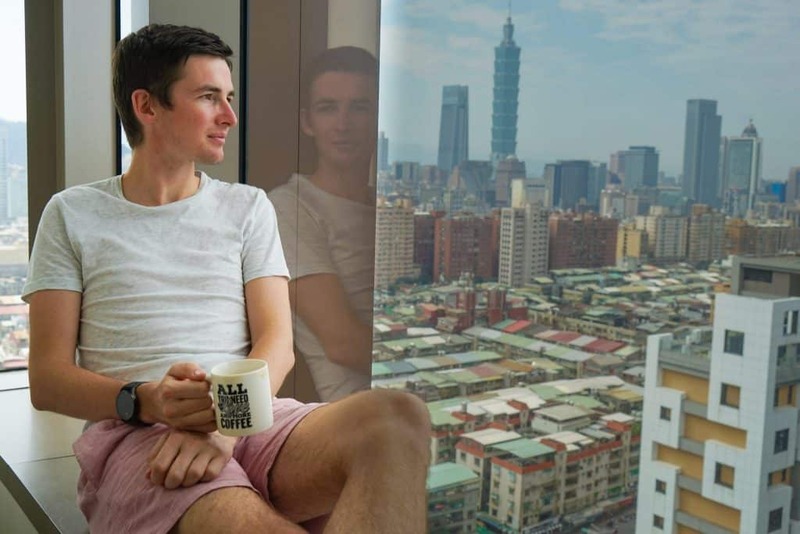 Finding the right location in Taipei can totally make your entire experience so deciding where to stay in Taipei is super-important… Luckily we discovered the trendy new hotel group: amba, during our recent visit and got our perfect ‘Taipei 101 coffee’ moment at amba Taipei Songshan hotel. 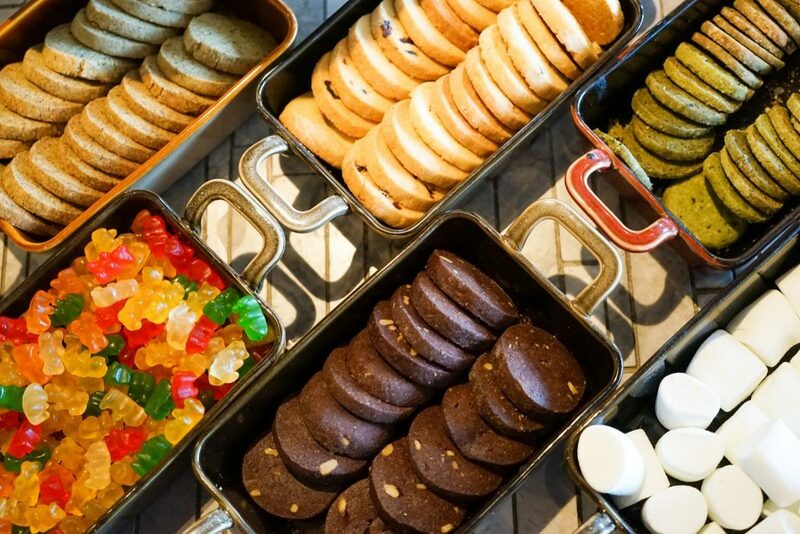 Travel is all about the memories after all – and there is no reason why these can’t be made back at your Taipei hotel as well! 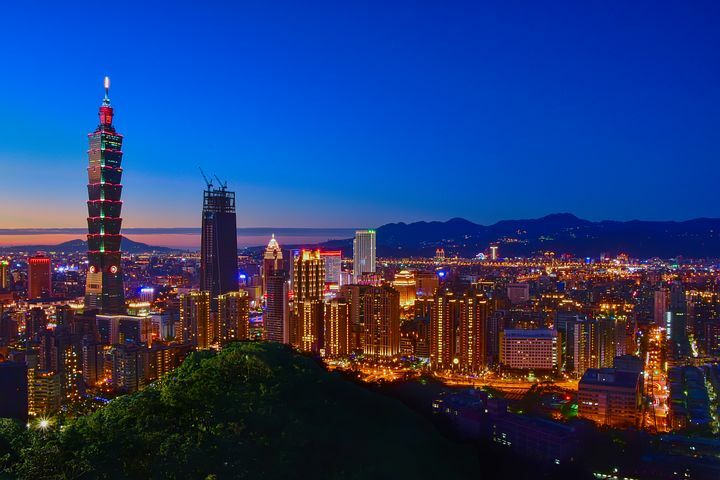 To get through all of these Taipei things to do you will need around 3-4 days and to stay focused on the central Taipei districts of Songshan, Xinyi, Zhongzheng, Zhongshan, Wanhua and Datong. We have also made exploring easier with a companion article giving a step-by-step Taipei itinerary for 3 days! However, if you can spare a few more days there are some incredible day trips from Taipei and you can find some inspiration ideals at the end of the article! 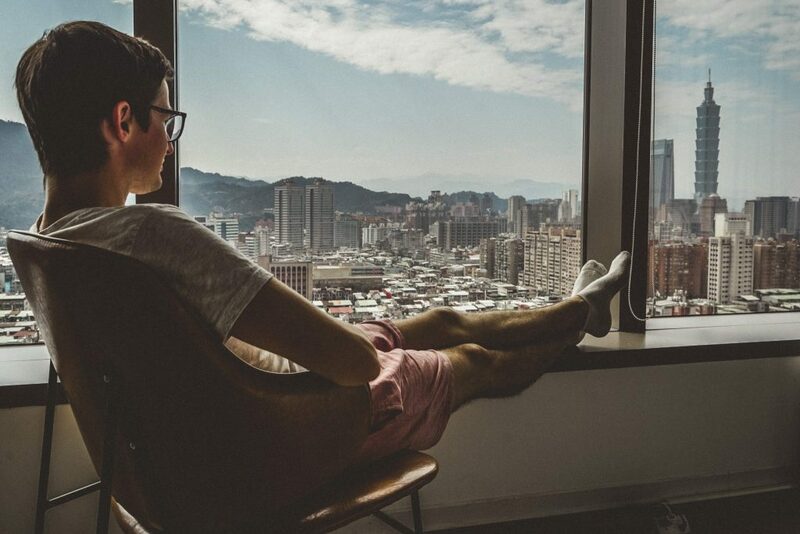 Where To Stay In Taipei For The Perfect Visit! 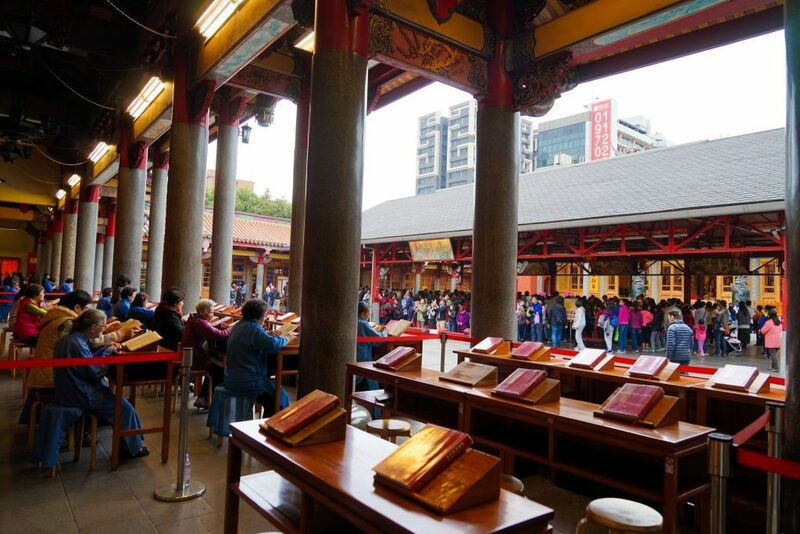 Founded in 1738, Longshan Temple in the Wanhua district was once the centre of urban culture in Taipei. Head here not only to observe religious life but also locals discussing community affairs and settling disputes. 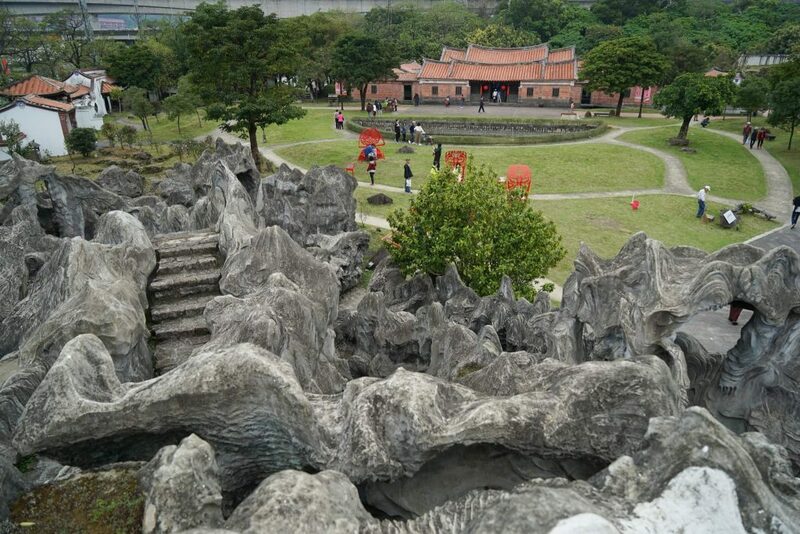 An excellent example of classic Taiwanese architecture be sure not to miss the one of a kind pair of bronze dragon columns at the entrance and appreciate the detailed woodwork and paintings that fill the roofs and halls. The centerpiece of the Taipei skyline is indisputably Taipei 101 and there is no better place to take it in than the top of Elephant mountain Taiwan. This small mountain not far from the downtown CBD has meandering trails to its peak. 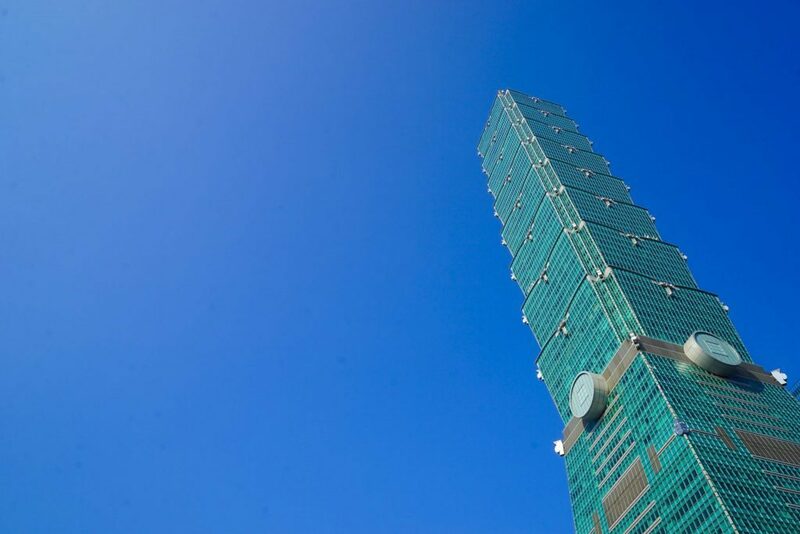 Just 183m tall it rewards walkers with stunning views across the city while huge stones near the top provide the perfect photo spot for that iconic Taipei 101 view. Head to the Elephant Mountain Taiwan for sunset to see the city bathed in red but avoid in the weekends if you’re not a fan of crowds. Constructed in the 1850s, Dihua street, then known as Centre street has been the center of local Taiwanese commerce ever since. 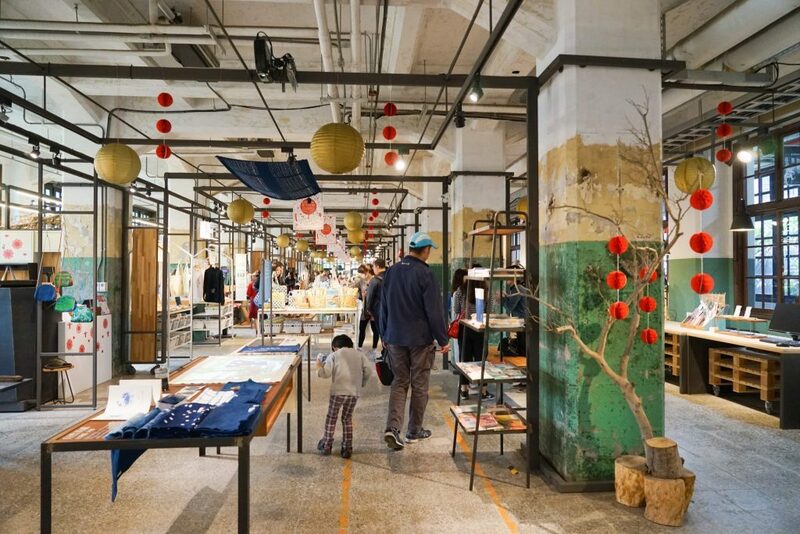 More than 70 historical buildings still stand with shopkeepers inviting shoppers to survey their array of traditional goods such as medicines, spices, herbs, dried fruit, and incense to name a few. If you’re here around Chinese New Year the street is at its busiest the 2 weeks before with Taipei residents in search of necessities for the holiday festivities. 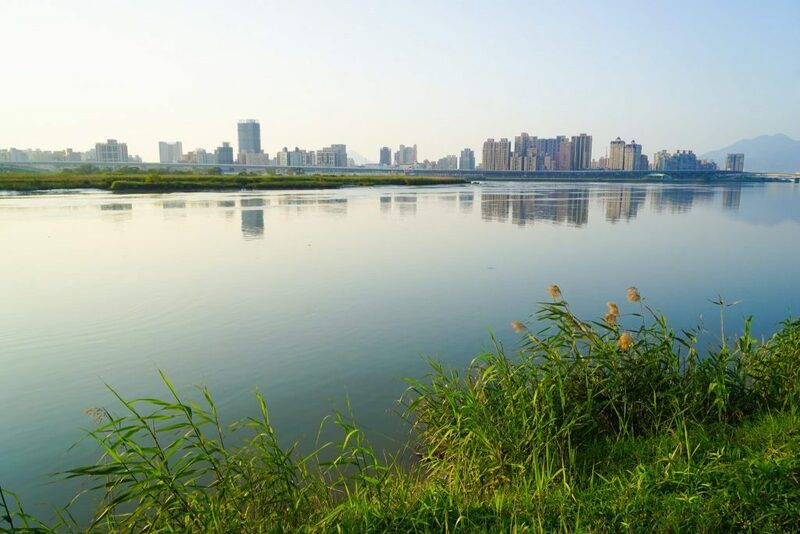 Thanks to the efforts of the city government the once dirty and polluted Tamsui and Keelung rivers now offer a scenic view to cyclists. 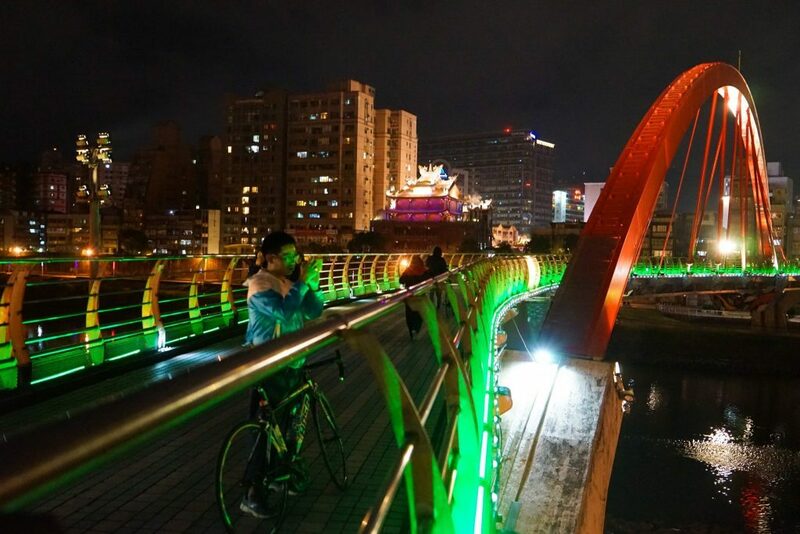 Popular with both locals and tourists the newly opened cycleways provide an excellent way to experience the leisurely side of Taipei. 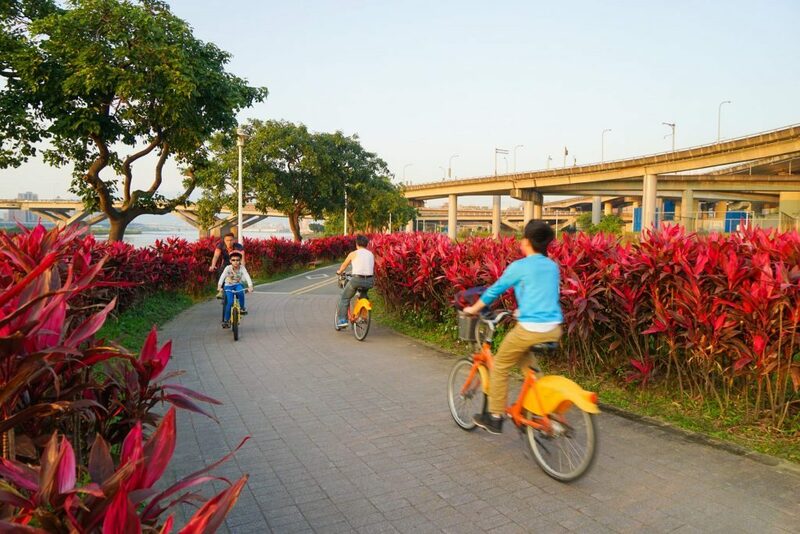 Simply rent a bike from the city’s public bike-share system, youbike, outside MRT stations and take in the cityscape before making your way to the riverside to see Taipei from a new angle. And if you really love it there is plenty more cycling in Taiwan. The Taipei Botanical garden is a great way to escape the hustle and bustle of the city. Located right in the city downtown the 9-hectare garden was founded in 1921 but dates back to 1897 where the Japanese colonial government set up a gardening institute here. 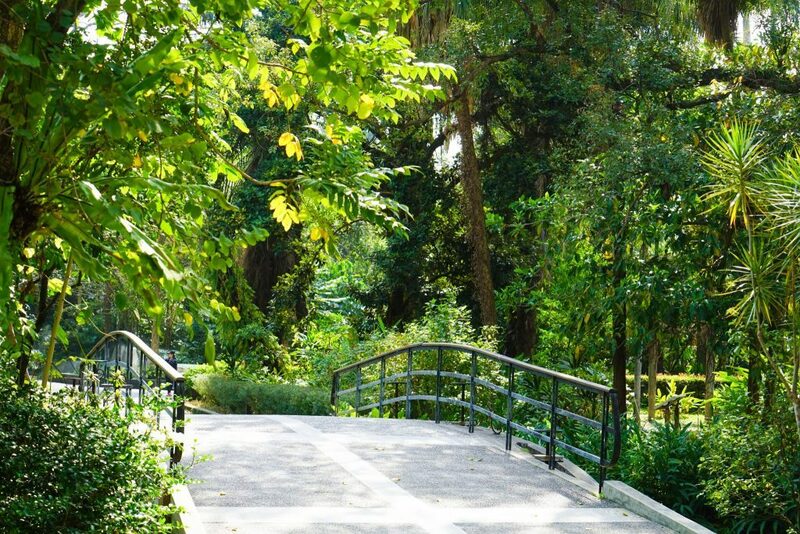 Take a relaxing stroll and enjoy the flowers and native trees while getting lost in this lovely green space. The Lotus flowers on the lake is a popular sight in summer but locals come year round to admire this collection of tropical plants. 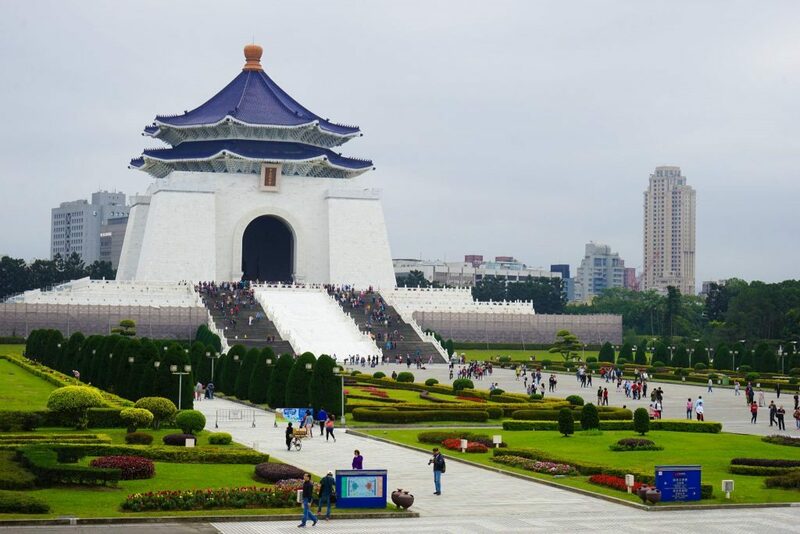 Also known as Freedom square and covering a space of 240,000sqm, this serves as the public gathering place of choice in Taipei since it’s completion in the 1970s. On passing through the giant main gate the square is home to 3 major landmarks. Flanked by the Taipei National concert hall and to the other side the National theatre the massive National Chiang Kai-shek Memorial Hall stands at its far end. Symbolic and historic in its design and architecture it truly is an impressive public space and a must see for any visit to Taipei. Get a double shot of cute at the Pet Halfway House and Cafe. 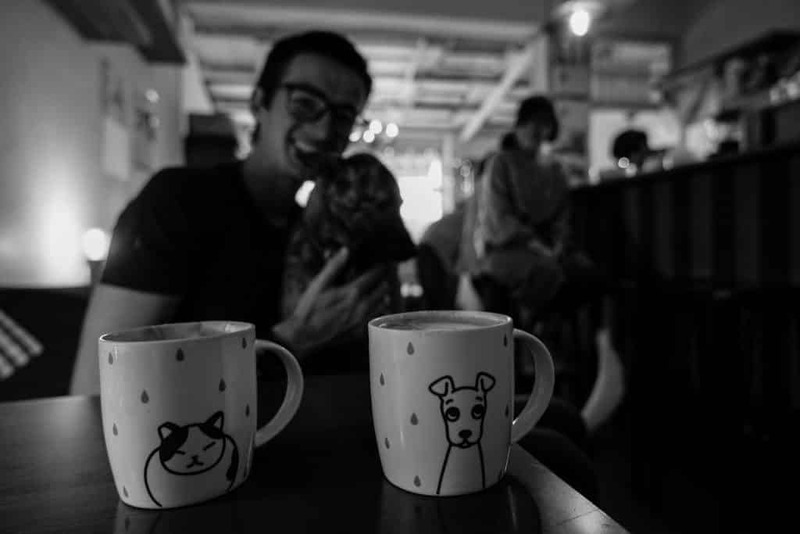 Not your usual pet cafe, here they not only serve great coffee but also take in stray and homeless pets. Given a thorough clean up and a bit of love these guys are then eager to meet you for plenty of pats and attention. 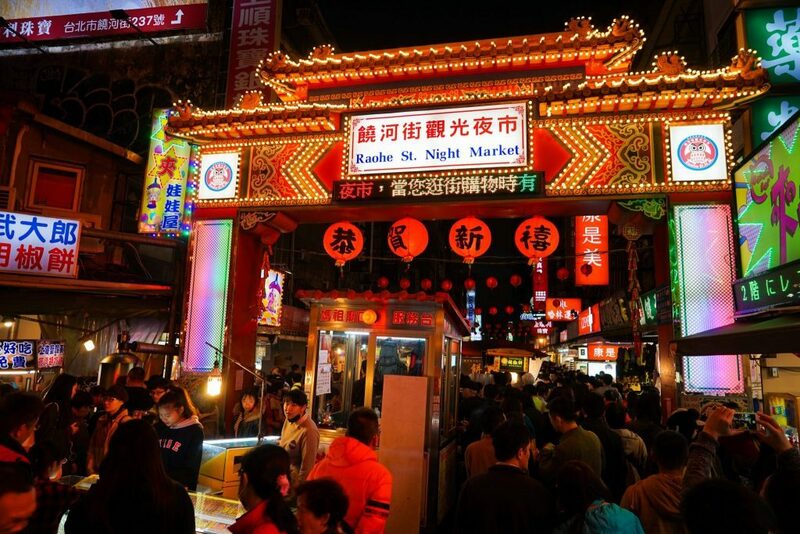 One of the most famous (and oldest) night markets in Taipei, conveniently located only a few minutes walk from amba Taipei Songshan hotel. 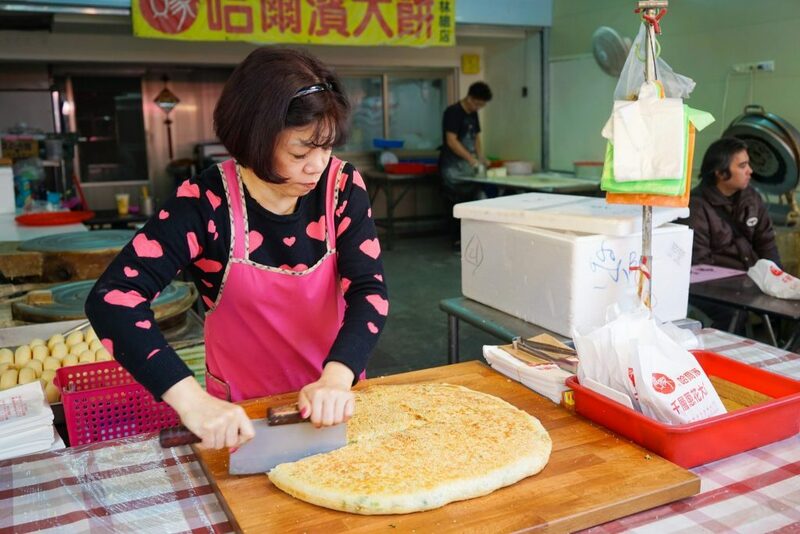 Come nightfall watch as 600 meters of delicious Taiwanese snacks, drinks and full-blown restaurants materialize and it seems almost everyone in Taipei – local or otherwise – come out to savor the smells and flavors! 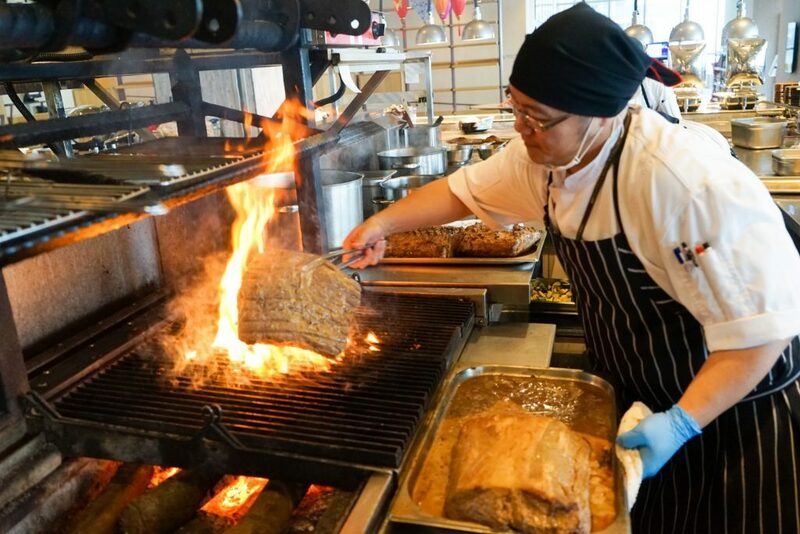 Want our advice to find the best places to eat at Raohe Night Market? One of Taipei’s oldest temples dedicated to the goddess of the seas. 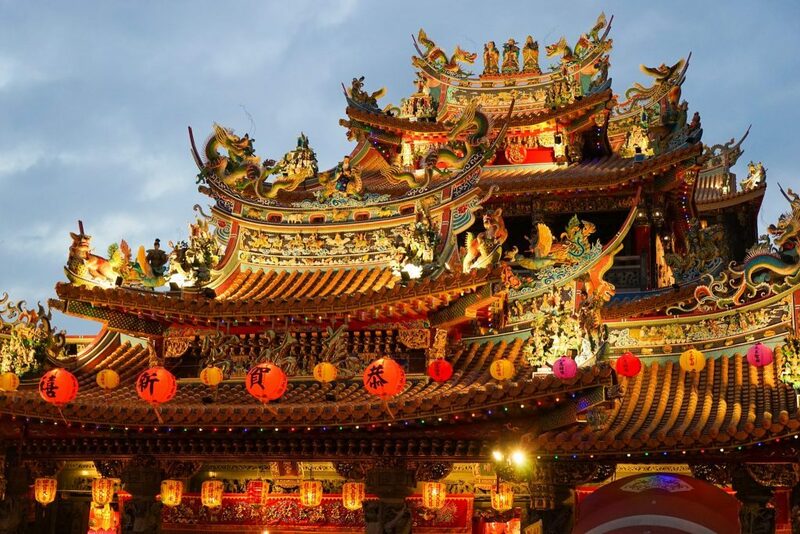 Impressive in size and covered in opulent decoration – complete with an elaborate roof covered in immortals and dragons – be sure to explore all six levels to truly appreciate the Ciyou temple’s beauty! Perfectly paired with an evening trip to the Rahoe Street night markets which begins right outside the front entrance. 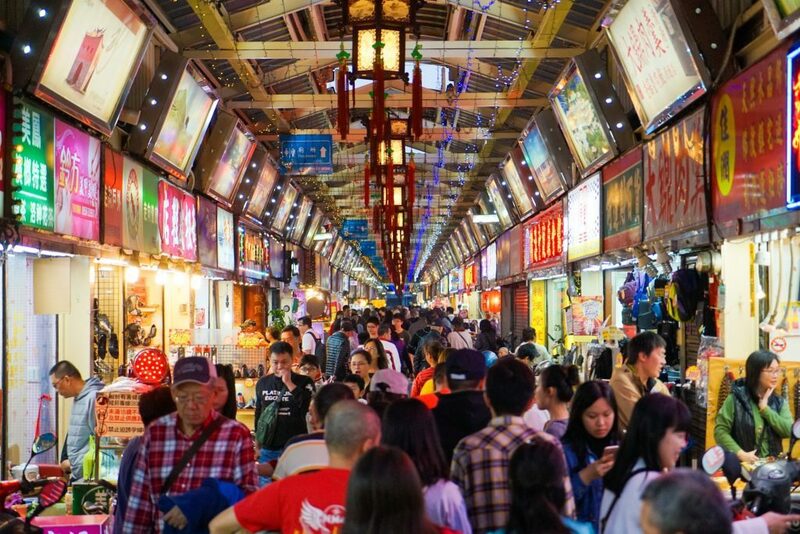 Previously known as the epicenter of vice and prostitution in Taipei, this night market has transformed over the past decade and is now the place to go for obscure food and Fear Factor style eating challenges. 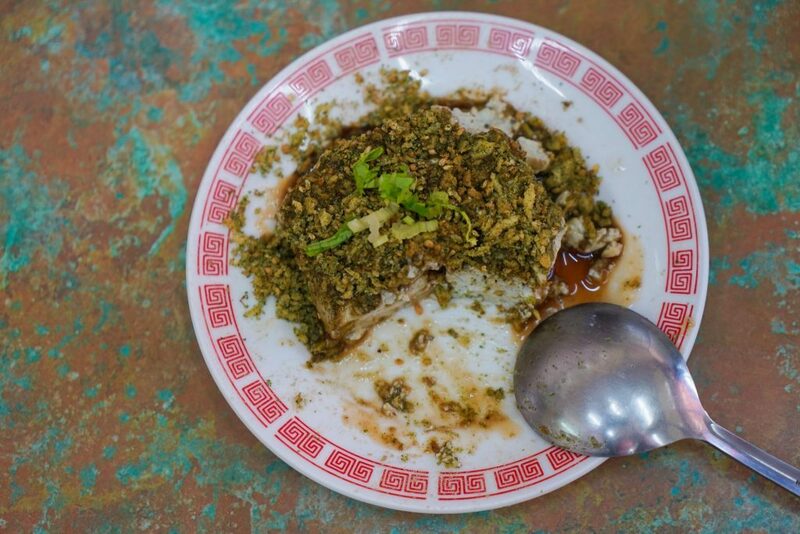 Although I do need to not there does not seem to be any prizes but I guess you can gain traveler street credit for eating turtle testicles, dried flying lizards and as expected plenty of snake-related dishes. 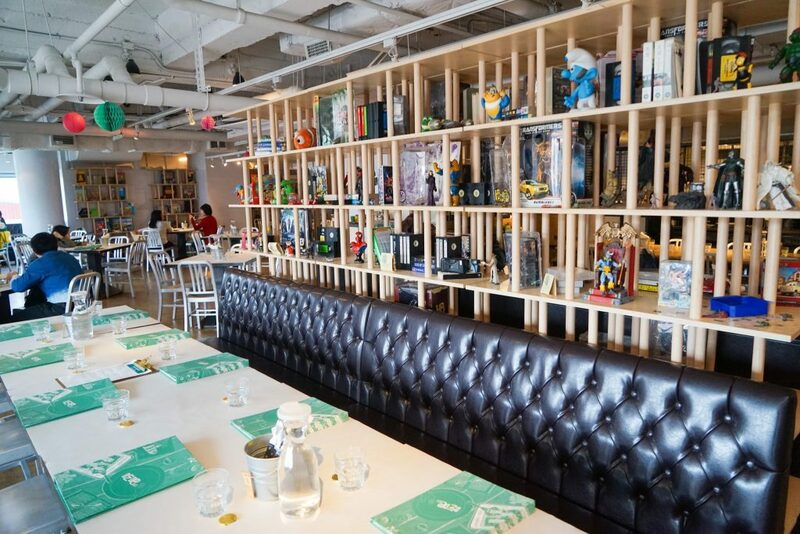 Honestly, I’m not a fan of seeing the poor snakes caged up next to hundreds of live mice – but to each is their own, and besides: there is plenty of other delicious ‘more normal’ food here anyway, and a great vibe! 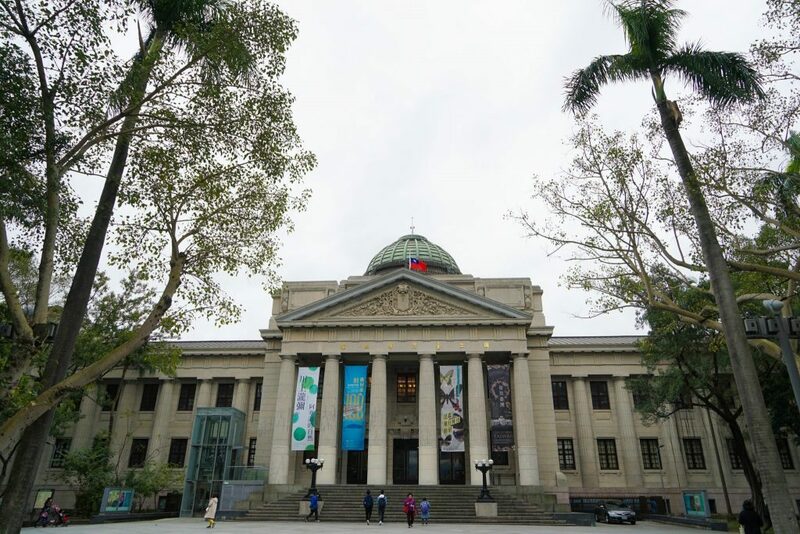 Located in the Botanical garden are not only beautiful flowers but one of the best collections of Chinese art in the world at the Taipei national museum of history. Exhibits are small, covering a wide range of dynasties, but most works are masterpieces. The entrance corridor boasts exquisite Buddhist sculpture, including a mesmerizing nine-layer stone tower with the thousand Buddhas motif which hails from the 5th century AD. Not to miss for any history buff. 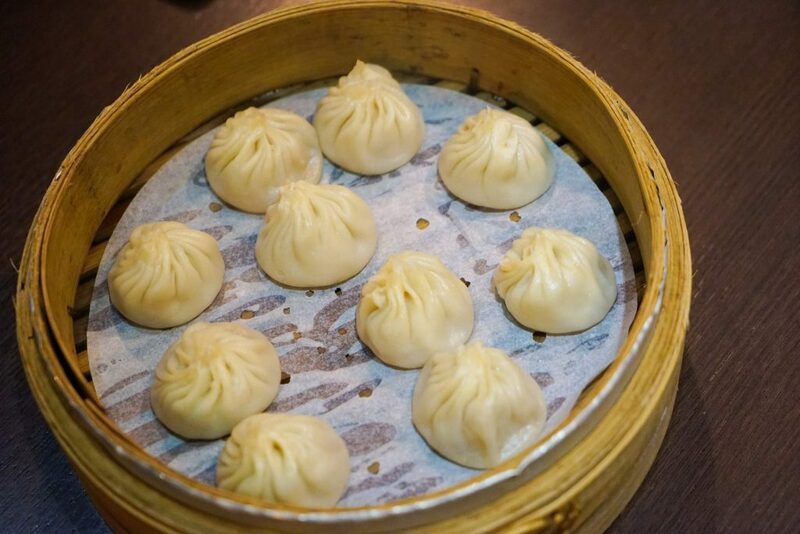 Visiting a country is not just about seeing their top-rated attractions, but discovering their cuisine – and this applies doubly for Taipei, a city which seems to run on delicious small bites and hidden gems. The problem, however, is finding such places, and where to even start! Thankfully, there is Taipei Eats Food Tour which offers to help you experience and taste amazing Taiwanese dishes all over the city. 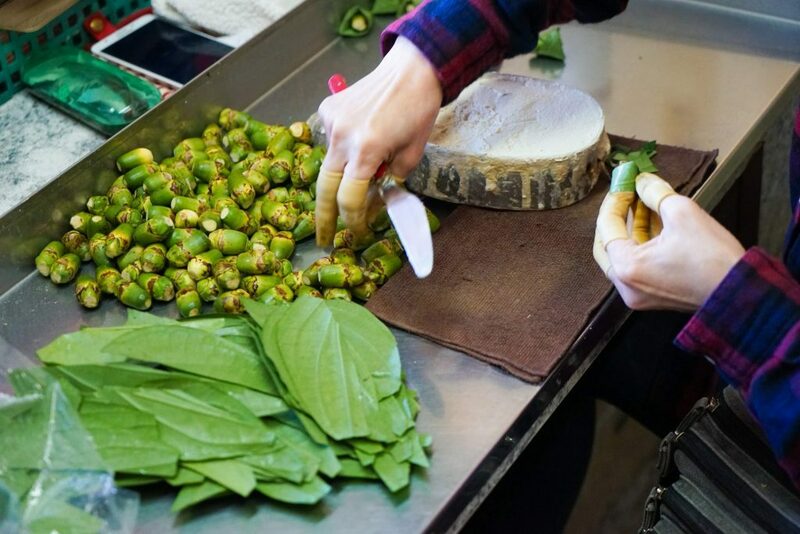 Skip breakfast for this one as you head to local markets and down dark lane-ways to find the absolute best food stops in Taipei and try everything from cold sesame noodles and pork belly stuffed Taiwanese burgers to stinky, stinky tofu and the notorious betel nut! You will be full for days and feel like you have seen more of Taipei than you ever could have on your own – A must do activity in Taipei. Built-in 1908 the Taipei Red House is a rare architectural design with a cruciform structure connecting with an octagonal tower. 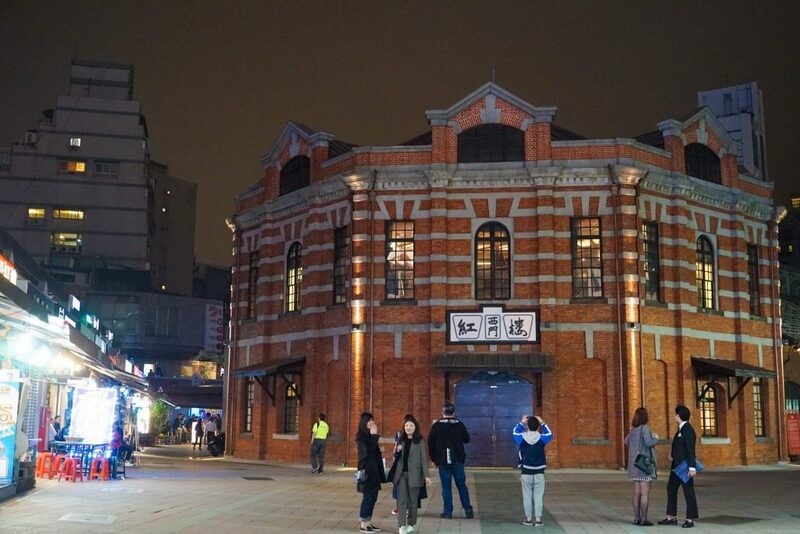 Currently an art culture venue with exhibitions and performance space the Taipei Red House building began its life as a public market. The area around the Red House still maintains a connection to it beginnings, holding an artistically inspired market during the weekends – and a few boutique craft shops inside. 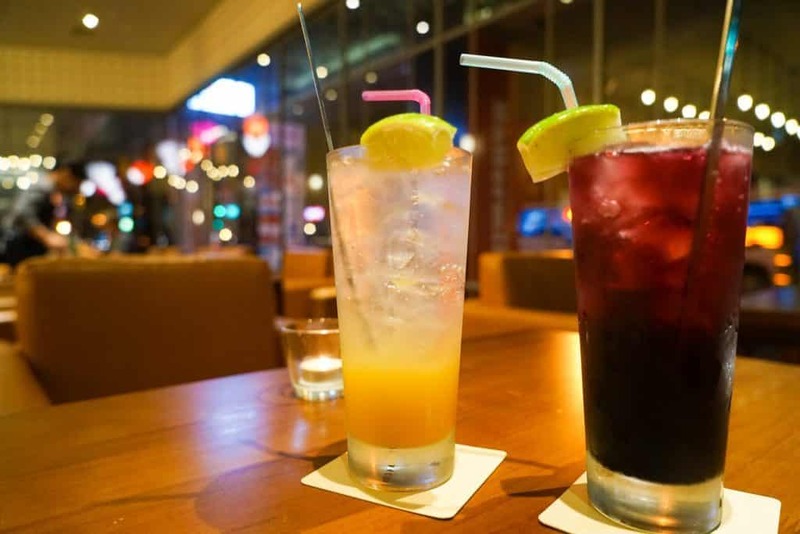 At night enjoy hanging out at the busy bar scene which has become popular with Taipei’s LGBT community. Literally a bridge with a twist. Looking up when walking along this bridge you can imagine a dragon swimming in the surface of a river. Visit at night when the bridge is lit up in a multitude of colors which give it its name. 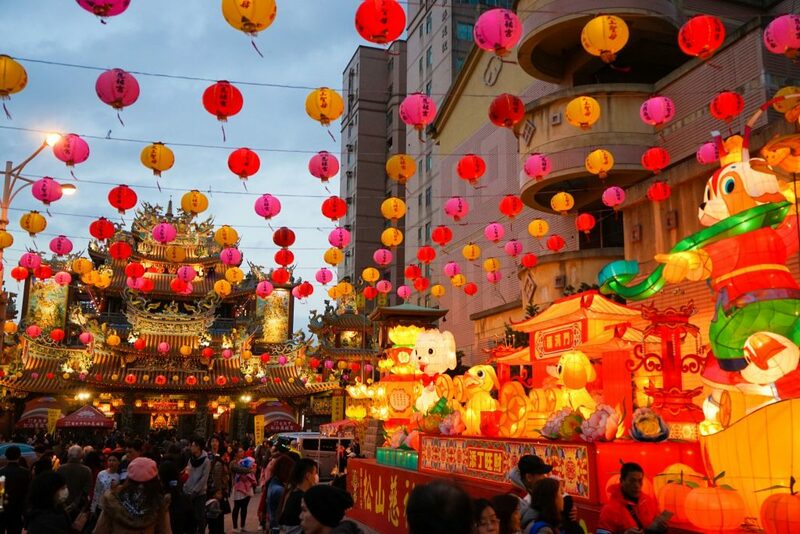 Located close the Rahoe Street night market it makes for an interesting little venture or see it while cycling along the banks of the Keelung River. The real must-see of any trip to Taipei the 101 commands attention as it towers above the city’s skyline. Once the tallest building in the world you can make a trip to its observation deck on the 91st floor. Also home to the world’s highest Starbucks, it’s possible to make it to the 35th floor for the price of a coffee, but a reservation is required in advance. Or if heights aren’t for you then you can still appreciate this magnificent building from below or cast a view across it from atop Elephant mountain. Not sure if this ups the game for toast or ice-cream but either way it’s something Id never seen before. The latest ice-cream delivery trend in Taipei is – believe it or not – toast. Imagine a lightly toasted box of sweet bread absolutely covered in your choice of ice cream, sauces and all kinds of sweet goodies. Maybe a way to finally make it ok to have ice-cream for breakfast! 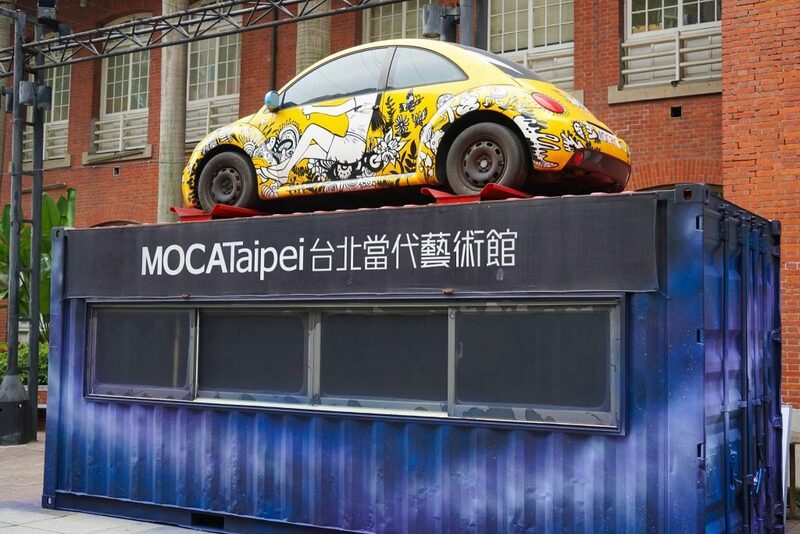 If you’re interested in Taiwanese art, this is the place for you. The museum of contemporary art houses a combination of both modern and contemporary artwork but also exhibits on Taiwanese colonial architecture during the Japanese colonization. A great place to lose a few hours in! 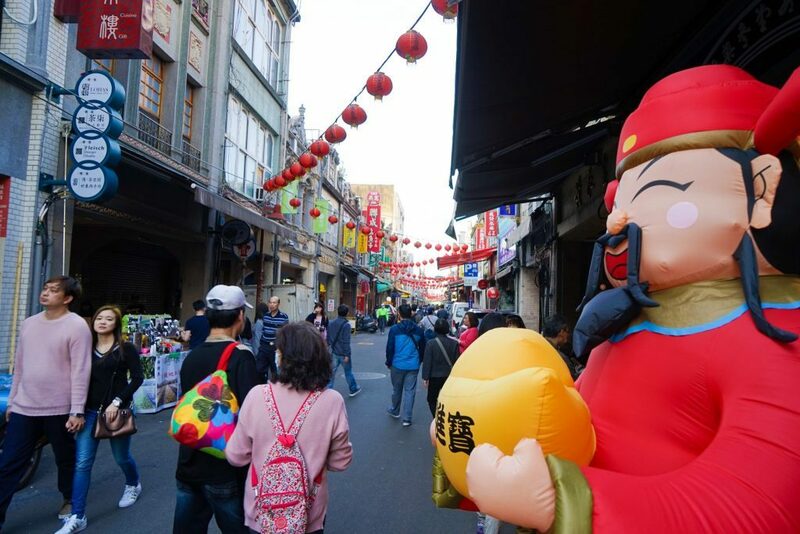 Termed the “Harajuku” of Taipei by the local tourism board, Ximending is a crazy maze of pedestrian streets filled with everything you could possibly imagine including quirky cafes, branded clothing, soft toys, claw machines and plenty of food. A popular hang-out for teens and street performers – and taken over by food carts in the evening – shopping in Ximending is something you will either love or hate, but either way you won’t know unless you go. 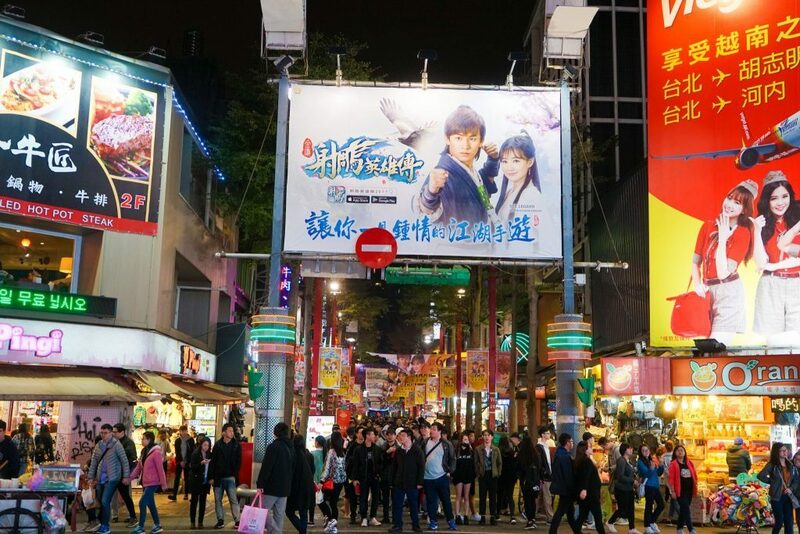 At night is the best time for you to visit as the neon lights of Ximending shine brightly and it seems the entire of Taipei comes out for the spectacle (and the nearby bar street / Red House gay district of Taipei is worth a pop-in too!). To be right in the center of all the action (and to escape it when needed) – why not consider a stay at the hip and chic amba Taipei Ximending hotel? 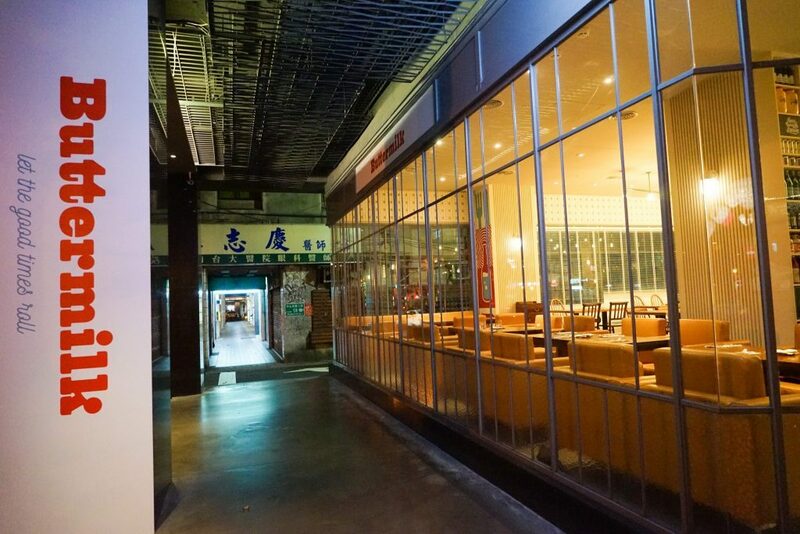 Looking for somewhere trendy to sip some of the best cocktails Taipei has to offer? Then there’s no going past Mud. Hidden within the base of the amba Taipei Zhongshan hotel this is the type of place that makes you feel as if you’re in on a secret that only the best few know. 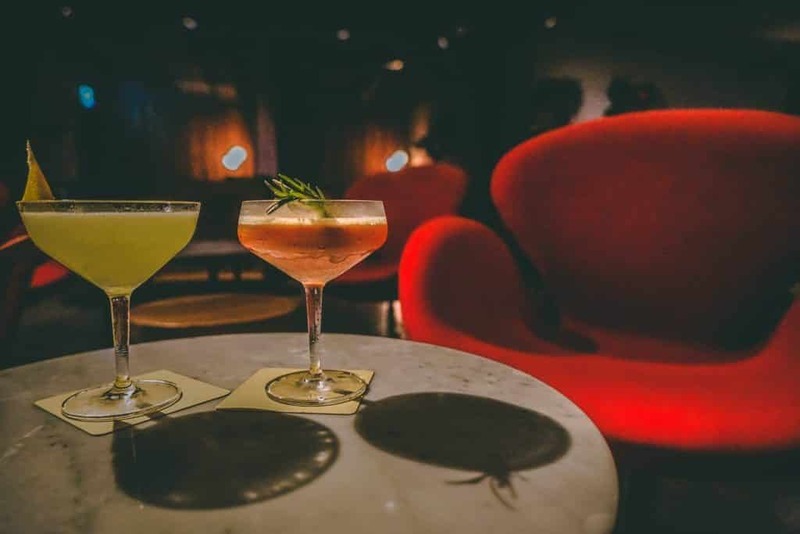 A chilled out atmosphere with quirky design and tucked away down an unassuming stairway this is a brilliant place to unwind and treat yourself to some of the best cocktails in the city. A stunning museum with the building itself a national historic site the National Taiwan Museum is the oldest in the country and a must see. Walking through the giant halls you’ll find displays on earth sciences, zoology, and botany that are relevant to Taiwan. Through themed exhibitions, the museum aims to show the importance of the cultural and biological diversity of this planet with a fun and modern approach. As you wander through the streets of Taipei you’ll no doubt come across one of these curious not so oddities. Resembling something like a children’s casino you’ll be surprised to find plenty of adults joining in the fun too. Bright colors, blaring music and packed with anything from soft toys to iPhones, see if you’re up to the challenge. 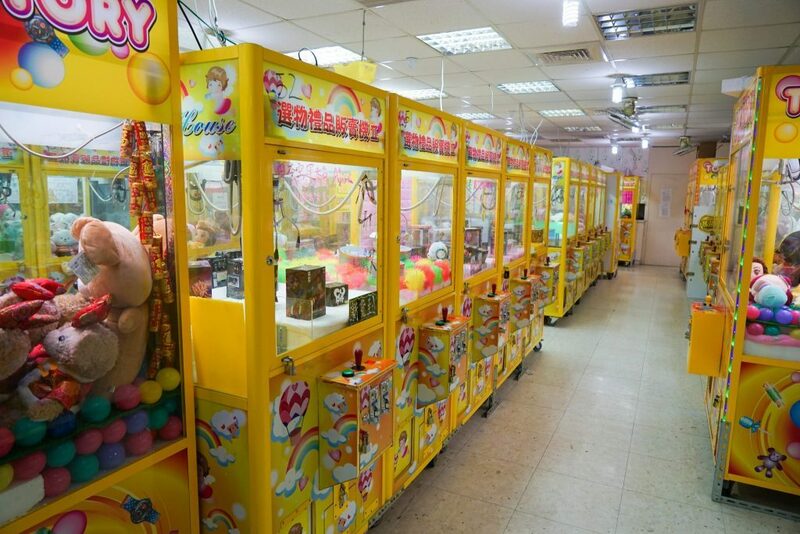 Yes we know they’re all probably rigged but for a couple of bucks what’s the harm in having a little fun and what were you going to do with that change anyway…..
Asia is known for its sheer number of weird and bizarre cafes and Taipei is often the home of many of these trends. 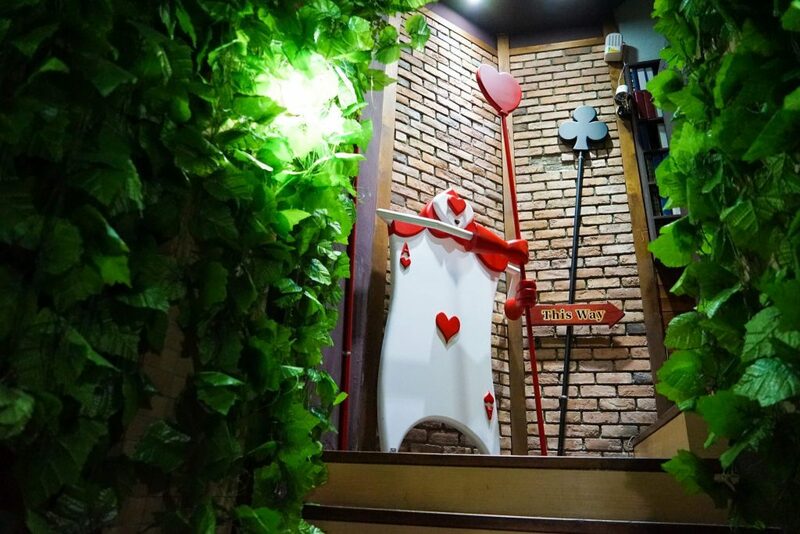 One place you will love is the Alice is Coming themed cafe styled like… you guessed it Alice in Wonderland. 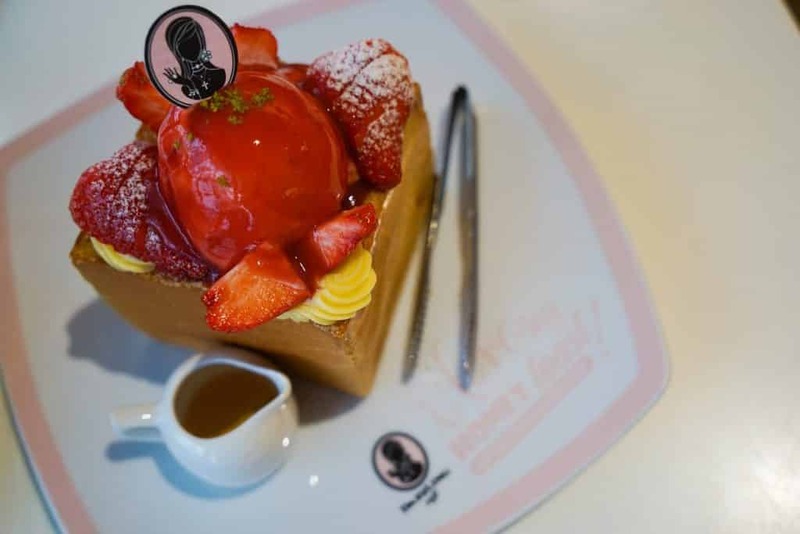 The food was rather delicious and drinks imaginatively named, you will share the experience with many cute couples canoodling over their Mad Hatter Tea Party. The staircase leading up to the second-floor restaurant does feel like you are being transported to another realm, though the ambiance is somewhat lost when Taylor Swift and P!nk singles were belted out over classic Alice songs. 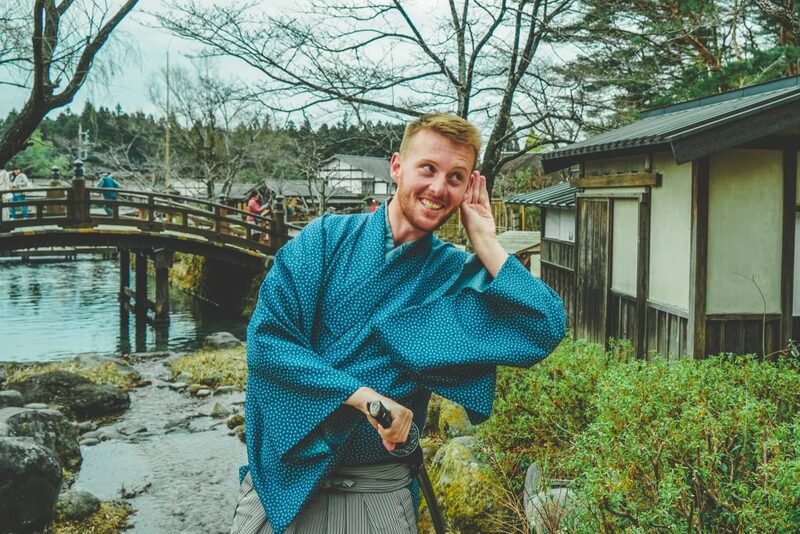 Great for a laugh and to get some great photos, eating at Alice is Coming Taipei is actually around the same price as other normal cafes so why not give it a shot! At first glance, this may appear like a good old American diner but don’t let its outside appearance fool you. This modern take on an American classic is anything but old – though the comfort food served up here is just as comforting as the original (or dare we say better?). 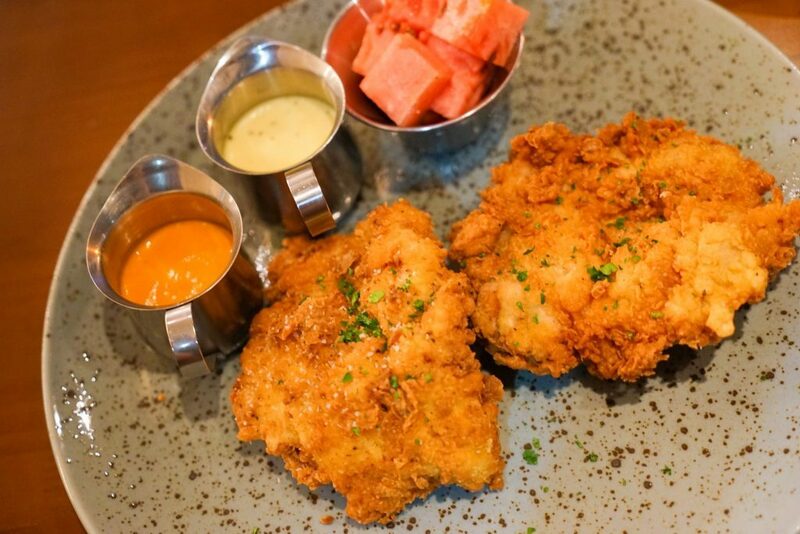 The most popular order – for good reason – is Grandma’s Buttermilk Boneless Fried Chicken with pickled watermelon, white cream gravy and Cajun hot sauce, which locals seem to be addicted to, but you should also accompany this with some delicious homemade buttermilk biscuits, hot wing lollipops and finish with a buttermilk and bourbon butterscotch pudding parfait. It doesn’t get much better than this – Unless you try the blueberry iced tea, in which case it does! 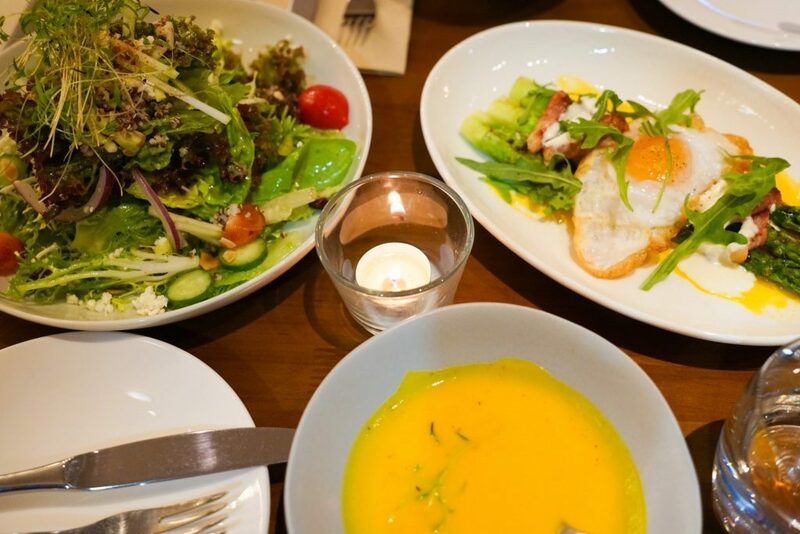 An excellent fusion of your favorite American food with a Taipei twist it’s no doubt a must visit restaurant in Taipei. Buttermilk is popular with both locals and visitors – so book ahead to avoid disappointment! 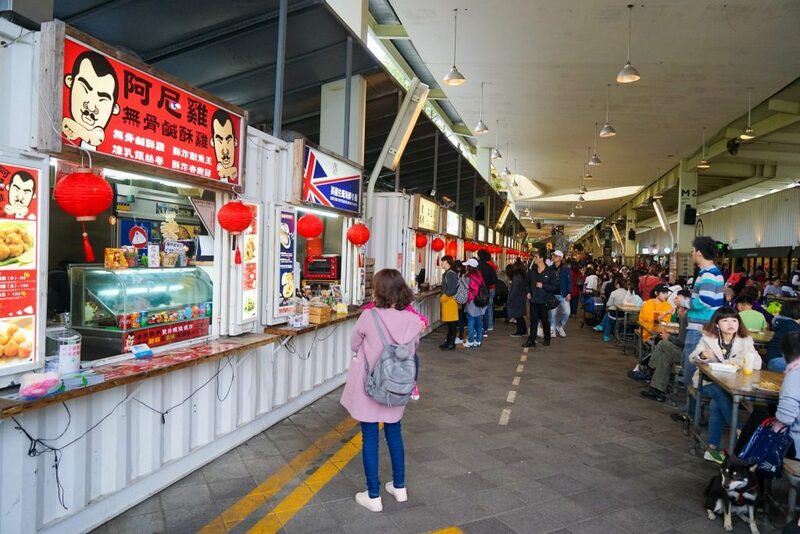 Newly opened with a slow-paced atmosphere meant for sauntering and enjoying life, you should not pass up a visit to the Maji Maji Square Food Market on the weekend (and the surrounding attractions). A popular temple in the center city, most likely due to its devotion to the patron God of the businessman, you’ll be sure to find many busy workers stopping by on their way to work. 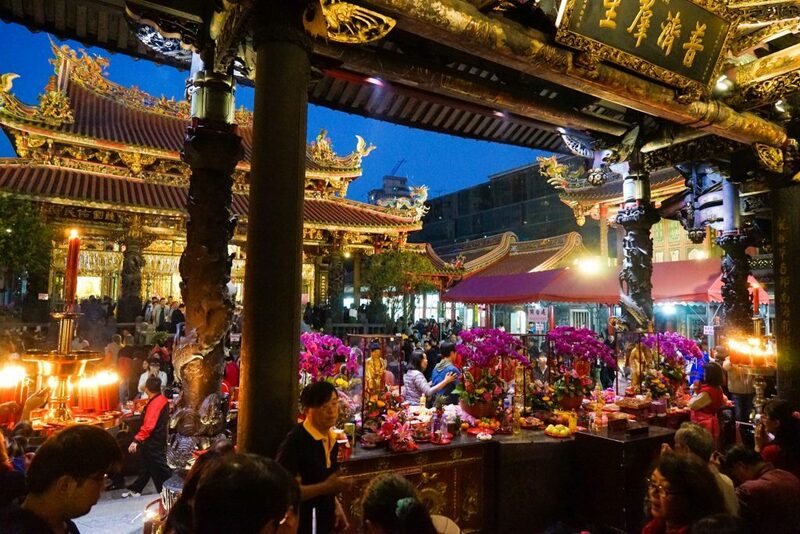 Although of relatively new origin it is still more than worth a look with its more modern design combined with traditional carvings and decoration – especially around the end of the lunar month when the air is thick with incense and many Taiwanese come out to seek answers to life’s questions. One of the oldest and few traditional houses preserved in Northern Taiwan. A brilliant example of early architecture in particular famous for its delicate carvings. 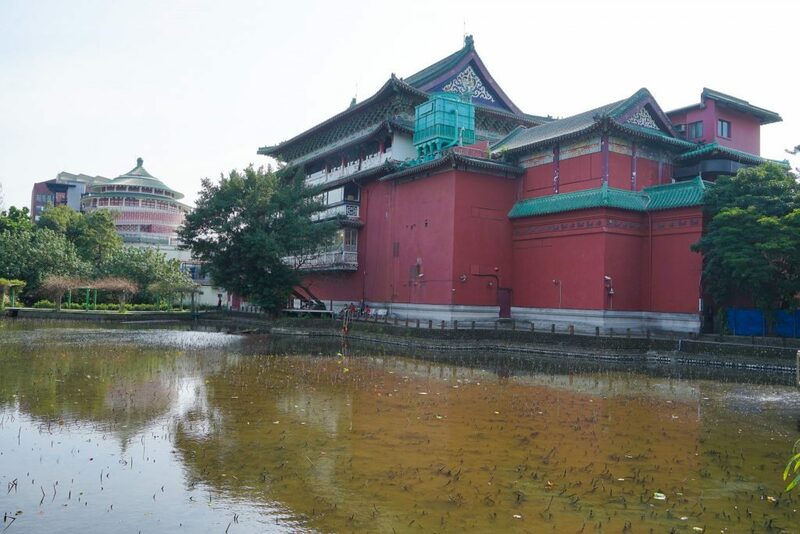 Now serving as a museum take a stroll through its rooms and many courtyards, enjoy the view across the lake from the pagodas and allow yourself to be transported back in time. 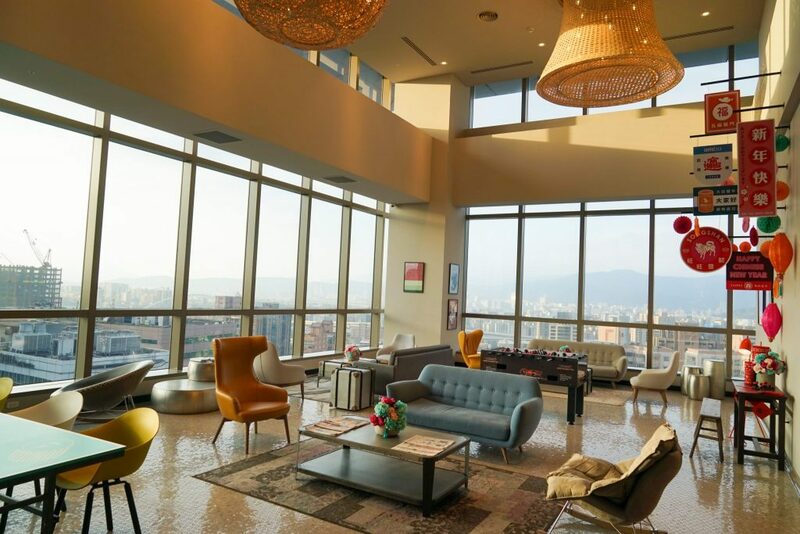 A standout even in the highly competitive Taipei luxury hotel scene, the amba Taipei Songshan hotel has it all and is guaranteed to leave you wanting for nothing! 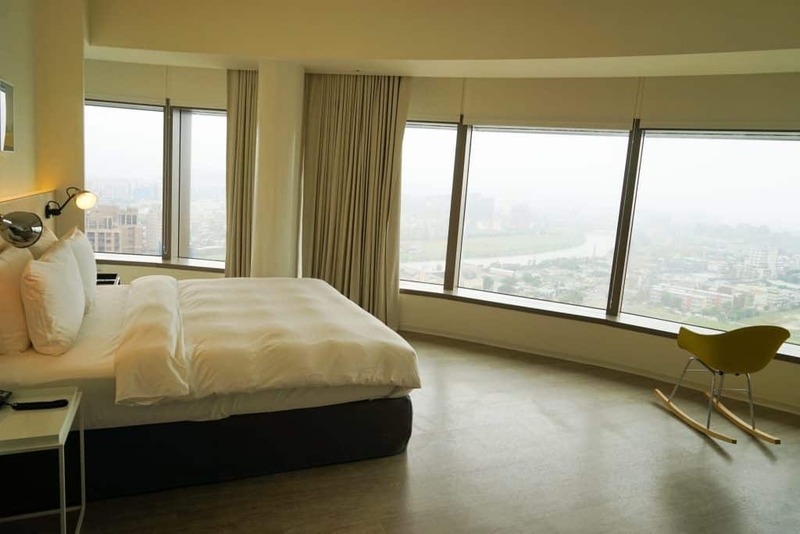 Situated on the upper-floors of modern highrise this lavish hotel in Taipei offers a unique perspective of the Keelung River, the iconic Taipei 101, the Songshan region and …well, nearly the whole city! You will be momentarily rendered speechless (and then quickly snap plenty of photos) of their unique Sky Lobby on the seventeenth floor, with a ‘in vogue without even trying’ vibe. For most guests the ultimate reason for staying here is the open rooms with magnificent yet simple design, expansive city views and eco-accommodating enhancements (though you can be sure the finer touches of luxury are provided for – such as a gorgeous Bluetooth speaker box crafted from wood, premium toiletries or dedicated WiFi routers in every room!). The amba Taipei Songshan is one hotel you won’t have any desire to leave… ever – and with a scrupulous wood-fire restaurant on location (celebrated by locals for its ‘thank god its the end of the week’ weekend brunches), blisteringly fast WiFi, chic cocktail bar and oversized beds you can truly feel at home here! Hand’s down one of the best new hotels in Taipei, and one of our favourite hotels in the world – the amba Taipei Songshan hotel is the perfect place in Taipei to stay for hip and cool stay with a dose of refined luxury! Located right in the heart of the super-trendy Ximending district, with the Taipei Metro Ximen Station and Red House Bar Street only a few minutes away, the retro-modern amba Taipei Ximending hotel is a popular choice for any traveller in Taipei looking for quality, location and nightlife – all at a great price. Housed on the upper levels of a recently renovated department store, this boutique hotel presents 160 designer rooms, a trendy casual dining / pizza restaurant and trendy bar pumping out hottest beats and live music on the weekends (not to mention the innovative cocktail collection!). Surprisingly however given it’s somewhat chaotic location, inside the hotel rooms is whisper-quiet providing a nice respite from the external world – and let’s be honest, when travelling everyone needs this at times! 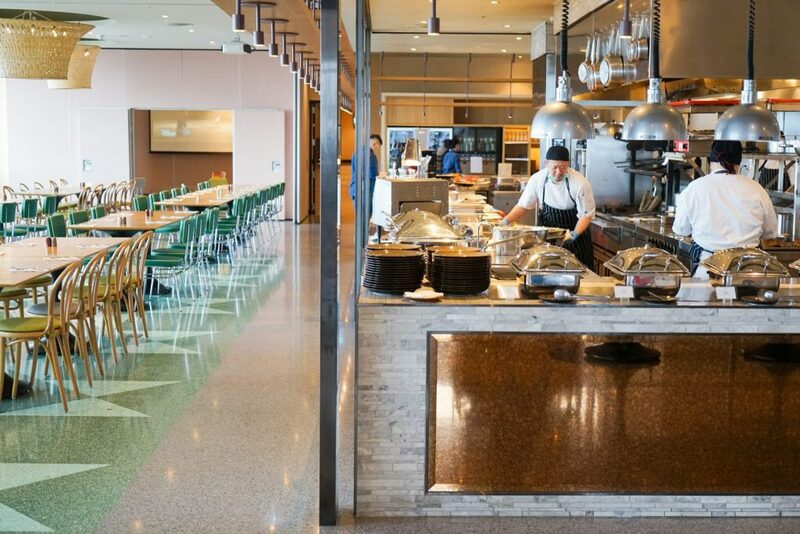 The included breakfast is a delicious mix of standard Western and Eastern fare with some delicious treats thrown in the mix, and is perfect considering Taipei often has a sleepy start and finding food before midday can be a bit difficult at times! Our favourite mid-range hotel option in Taipei in one of the top locations, the amba Taipei Ximending hotel is easily one of the best places to stay in Taipei for value, a good nights sleep and funky design. As they say: location is everything!